If you dream of standing out from the crowd, have I got a role model for you! Allow me to introduce this week’s muse, Lizzie, who is unique as they come. Endlessly chic and full of creative ideas, Lizzie is all about putting her own spin on things – whether it concerns fashion, travel or, my favorite, invitations. She and her fiancé Daniel decided to get married in the colonial town of Antigua, Guatemala, and asked me to create invitations that reflected the event’s extraordinary location. Using the country’s colorful national bird, the quetzal, as a focal point, I hand painted a custom watercolor of its spectacular tail feathers, using it to decorate the main invite. As save-the-dates, we took our super-popular airline ticket design and customized it for Lizzie’s big day, tucking it inside black, faux-croc sleeves. So very jet set! Needless to say, Lizzie’s party was a smashing success. Wearing Kristian Aadnevik, she walked down the aisle to the “Star Wars” theme (which made the guests unexpectedly start to cheer! ), later turning the reception into a candle-lit colonial fairy tale. Inspired by her fashionable take on such lush surroundings, I had fun creating my own version of the story, below. 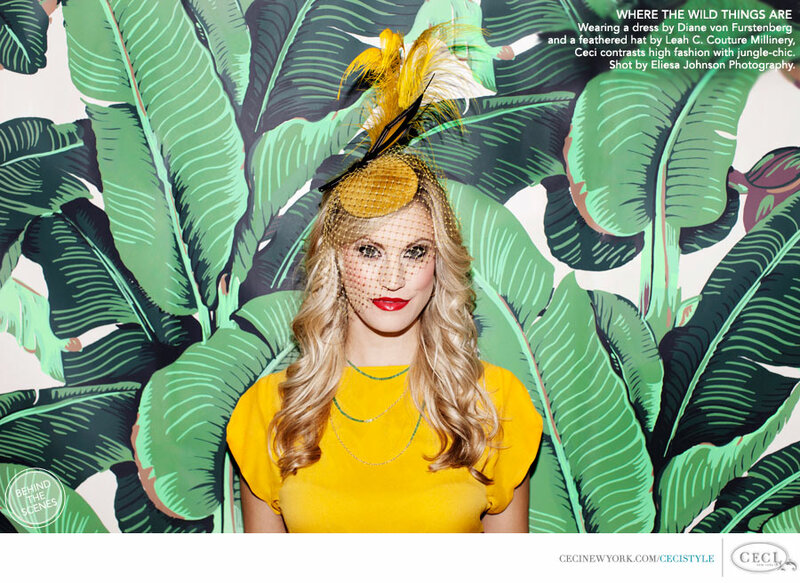 For more bright inspiration, check out this week’s accessory and gift idea-filled Get the Look, then read on for expert tips from Timothy Lee Photographers and artful milliner Leah C. Now it’s your turn: what’s on your list of uniquely-you ideas? Photography by Eliesa Johnson Photography. View the Creative Team in Behind the Scenes. View the video of the CeciStyle cover shoot now! Check out the behind-the-scenes video of our cover shoot for this issue (and even a sneak peak at some upcoming issues!). Special thanks to Allan Zepeda for creating this exclusively for CeciStyle magazine. And big love to the entire creative team who made this shoot possible.